Thallus: appressed rarely pendulous, sometimes imbricate, up to 10 cm broad; texture: cartilaginous; branching: variable; budding: present lobes: contiguous or separate, (1-) 2-4 mm broad, sometimes black bordered; profile: pinched and swollen; width/height ratio: 0.5-2; tips and axils: perforate upper surface: white to greenish gray, sometimes dark mottled, becoming rugose; soredia and isidia: absent, lobules sparse or absent medulla: hollow, ceiling of cavity dark, floor of cavity dark lower surface: black, rarely perforate Apothecia: common, substipitate, up to 10 mm in diam; stipe: urn- or funnel-shaped, hollow; disc: brown ascospores: broadly ellipsoid, 6.5-8 x 5-6.5 µm Pycnidia: common conidia: rod shaped to weakly bifusiform, 5-7 x 0.6-0.8 µm Spot tests: cortex K+ yellow, C-, KC-, P+ pale yellow, UV-; medulla K-, C-, KC+ orange-red, P- Secondary metabolites: upper cortex with atranorin and chloroatranorin; medulla with physodic acid (major), 2'-O-methylphysodic acid (minor accessory), 3-hydroxyphysodic acid (rarely accessory), and unknowns C7 and C8 (uncommon minor accessories). Substrate and ecology: on bark and wood, including both conifers and hardwoods, most frequent in cool, moist, suboceanic conifer forests north of the Sonoran region World distribution: Alaska to northern California with sporadic records south to Santa Barbara County, California, inland to western Montana and Alberta Sonoran distribution: disjuncts in the coast ranges to Pt. Sal Ridge, Santa Cruz Island, and Santa Rosa Island. Notes: This species is characterized by esorediate, puffy, swollen lobes with dark interiors and perforate tips; always P-. 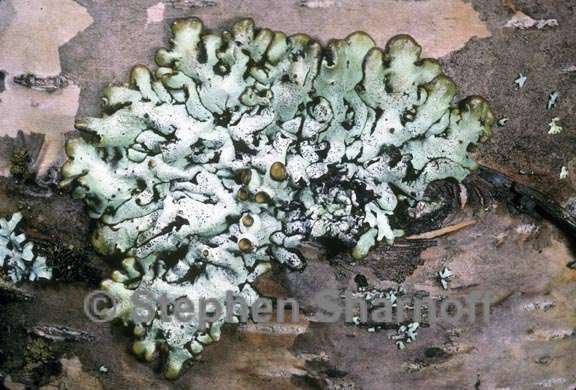 In the southern end of its range specimens are often depauperate, but no consistent differences from northern populations other than thallus size and lobe size could be found. Spores may be smaller and more elongate in the California populations than in the Pacific Northwest, but more study is needed. An unusual form is common near Los Osos, forming compact masses of narrow (c. 1 mm wide), imbricate lobes.